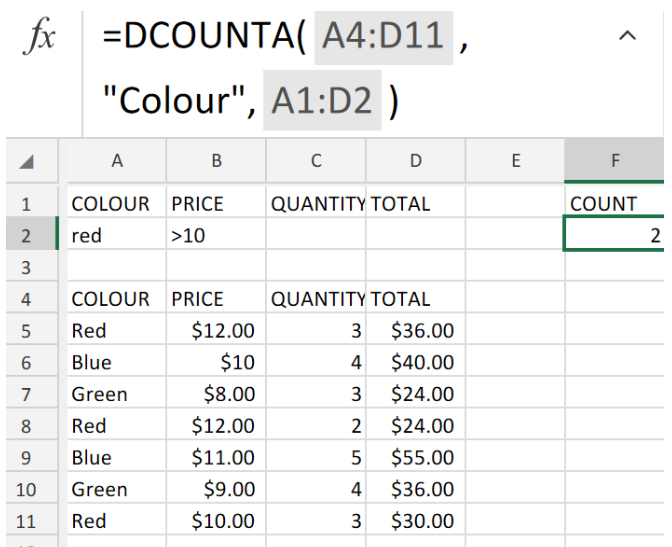 Figure 1. of Excel DCOUNTA Function. We can be required to count matching records within a database by using specific criteria and an optional field. To do this, we can utilize the Excel DCOUNTA Function for counting the matching records within our worksheet database. This tutorial will walk through the process. 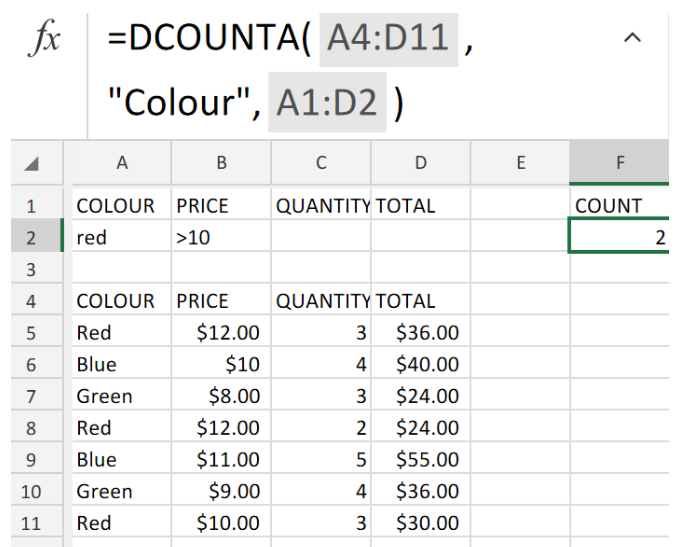 How to Use the Excel DCOUNTA Function. 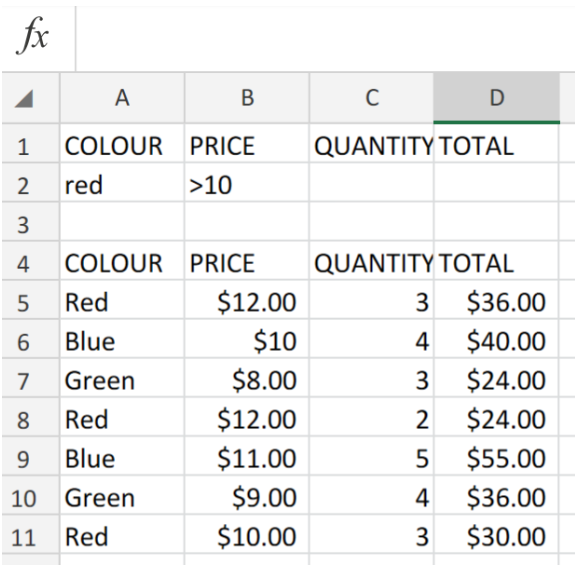 Figure 2. of Database Entry in Excel. 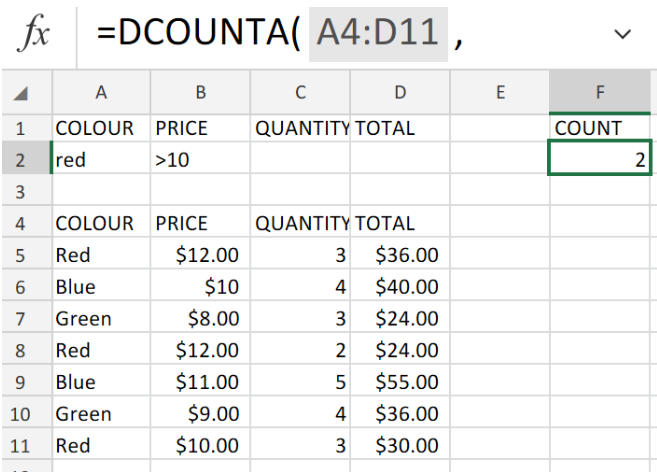 Figure 3. of DCOUNTA Function in Excel. The field range of cells is the entire column A (labeled COLOUR) in our Excel sheet. The range of cells for our specified criteria is A1:D2 in our Excel sheet. In the event that a cell within our database is empty, that cell will not be counted. The Excel COUNTA Function will by default, count both text and number values in a given field as long as the specified criteria is matched. In the Database sheet, enter conditions in the criteria range for unoccupied two- and three-bedroom apartments that need to be remodeled. Enter criteria as text only, without use of quotation marks. Be sure to enter the criteria separately in rows 3 and 4. Apply an advanced filter based on the criteria range (A2:H4). Filter the existing database (range A15:H65) in place. Nine apartments meet the advanced filter conditions. In cell C8, use the DCOUNTA database function to calculate the number of apartments that need to be remodeled based on the advanced filter you created. how do I write a dcounta formula based on a criteria range? In cell C8, use the DCOUNTA database function to calculate the number of apartments that need to be remodeled based on the advanced filter you created.